For the past 30 days I have been playing vegan. The first 15 days were a learning experience and was mostly just about adapting. The second half was surprisingly more challenging for me… and I did end up cheating at one point (which I thoroughly enjoyed). It started getting difficult just around the 2 week mark. I suspect that I wasn’t meeting my nutritional requirements, both with calories and protein. I lost 6 lbs. over 4 weeks, which for my size is a lot. I suspect that some of it was water weight, although some may have been muscle and fat. My running went from around 30 miles a week to about 22 miles and my strength training stayed about the same. My energy levels were also lower, which likely is related to the drop in calories and protein. Normally I eat around 2,400 calories a day including 100 g of protein. Over the past 30 days I was probably around 1900 cal. and 65 g of protein. While this would be fine for an average female, this isn’t enough considering my activity level. I think this is a diet that a lot of people could learn from. It gets you to eat more vegetables and the probable imbalances in the diet are the opposite of the imbalances in the standard American diet. I think the rest of the world could learn from the vegan diet. The average American does not get enough fruits & vegetables. Vegan diets generally are more environmentally friendly and have less processed food. In addition, most of our meat (not all) is produced in factory farms which are having toxic effects on the planet. As consumers, we are inclined to only look at one side of the story. When we buy products we usually consider how it affects us. However, it is becoming increasingly clear that there is another side that we should consider. What went into this product? How was it produced? What is the impact of their methods towards humanity and the environment? Do I support the way they run their operations? Over the last few decades, food production in the US has shifted to a system that is dominated by industrialized factory farms, owned by only a handful of corporations. The rise of industrialized farming has run smaller local farms out of business. In addition, there are a handful of concerns with the impact of factory farming. Among them is the beef industry. 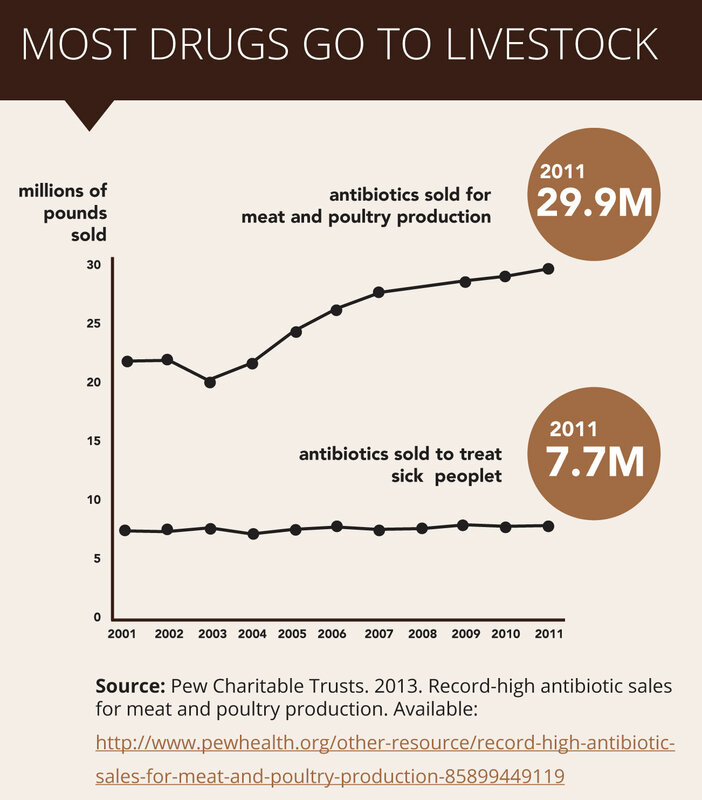 80% of antibiotics used in the US go to farm animals, including livestock. Why? Cattle in industrialized farms are in small overcrowded spaces which are stressful to the animal and make infections spread more easily. The counteract this, many industrialized farms give their cattle low-levels of antibiotics to prevent infection and promote weight gain. Why is this bad? Using low-levels of antibiotics in crowded spaces encourages the development of antibiotic resistant bacteria. Antibiotic resistance has become of the greatest public health threats our world faces, this threat is in part due to inappropriate use of it. Easily treatable infections can once again become life threatening as they were before antibiotics. The FDA recently added rules to phase out the use of antibiotics. These rules are on a volunteer bases and only cover specific drugs that are commonly used to treat humans. While this move may improve public image, it really doesn’t do much to end inappropriate use of antibiotics in livestock. Most cattle in the U.S. are given anabolic hormone implants to promote faster growth. There are six steroids used, in varying combinations. Giving steroids to beef makes them grow more muscle and makes them grow faster, this makes them cheaper to raise and gives the beef industry more meat to sell. Is it safe? While the U.S. government claims the use of antibiotics is safe, the European Union has banned meat that have been given hormone implants. There is a surprising lack of research given how widespread hormone added meat is. Despite the lack of proof that it is actually safe, the majority of the U.S. beef industry continues the practice with little concern for what that means for anything beyond their own profit. What are the concerns? There are concerns that the hormone additives that are in the meat may cause birth defects and change the sexual development in children. There are also concerns that it may cause cancer. 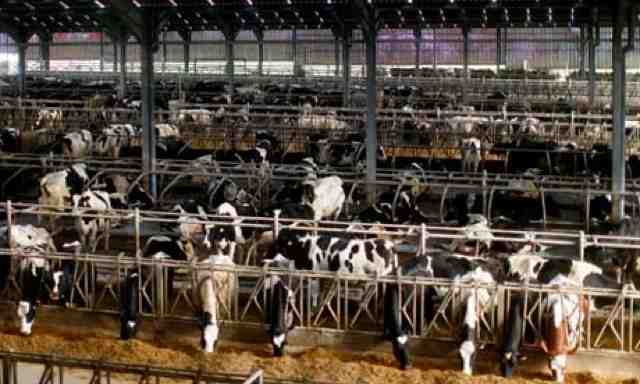 Animal Manure: Factory farms are overcrowded. The high concentration of animals in a small space makes managing waste complicated. The disposal of the waste harms the air, water, soil and nearby farms. To add on to this, livestock waste is not processed for sanitation. The waste is often mixed with water which is then sprayed on crops. This can spread infectious diseases such as E. Coli (which they also may have helped in making it resistant to antibiotics). When the manure/water pits become overfilled, it can leak which can eventually end up in surface water. Air Pollution: Factory farms pollute the air with methane and hydrogen sulfide. These gases contribute to global warming and may cause harm to those living nearby. Air pollution is often the result of the overuse of machines, mismanagement of waste and harmful feeding practices. The industrialized cows have to live through unnecessary cruelty. For identification purposes, cows are branded with a hot iron causing third degree burns. Male calves testicles are ripped from their scrotum. The horns of cows raised for beef are cut or burned off. Livestock fed diets high in grain often suffer from chronic digestive pain and conditions such as acidosis.Rather changing their diet to grass-fed, they are given low-level doses of antibiotics so they keep growing. The antibiotics don’t do much for the suffering of the animal. The feedlot air is filled with ammonia, methane and other harmful chemicals. These gases cause chronic respiratory issues. The livestock are often in very crowded environments. These environments are uncomfortable and very stressful to the animals. Support Small Local Sustainable Farms: Small farms are having an increasingly difficult time competing with the bigger industrialized farms. It is important for both economical and environmental sustainability that local farms are supported. You can find local Certified Humane products here. You can find local sustainable food here. If you find a local farmer and make a seasonal deal, you may be able to get a discount on the meat. American Grass-fed Certified: Applies to beef and lamb. Requires humane treatment, open pastures, and a grass-only diet for all animals and prohibits use of all antibiotics and hormones. Certified Humane: No Cages, No crates, no tie stalls. animals must be free to do what comes naturally. A diet of quality feed, without animal by- products, antibiotics or growth hormones. Producers must comply with food safety and environmental regulations. Processors must comply with the American Meat Institute Standards (AMI). Eat Less Meat: You can reduce the amount of meat you consume or stop eating it all together. Spread the Word: The more people that know about factory farms and other problems with our food system, the more pressure there will be for legitimate regulation and reform.